In May 2017 my brother Jim and I traveled on a tour of central Europe. 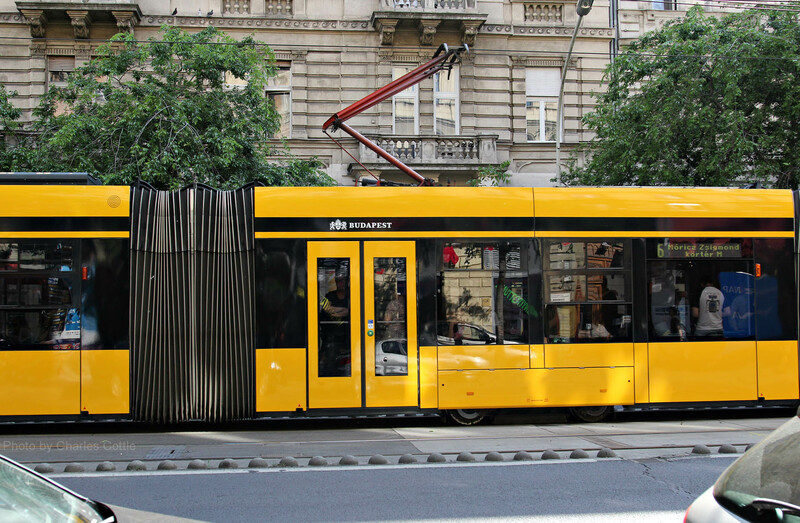 The major cities on the tour included Budapest, Vienna, Prague, and Berlin. 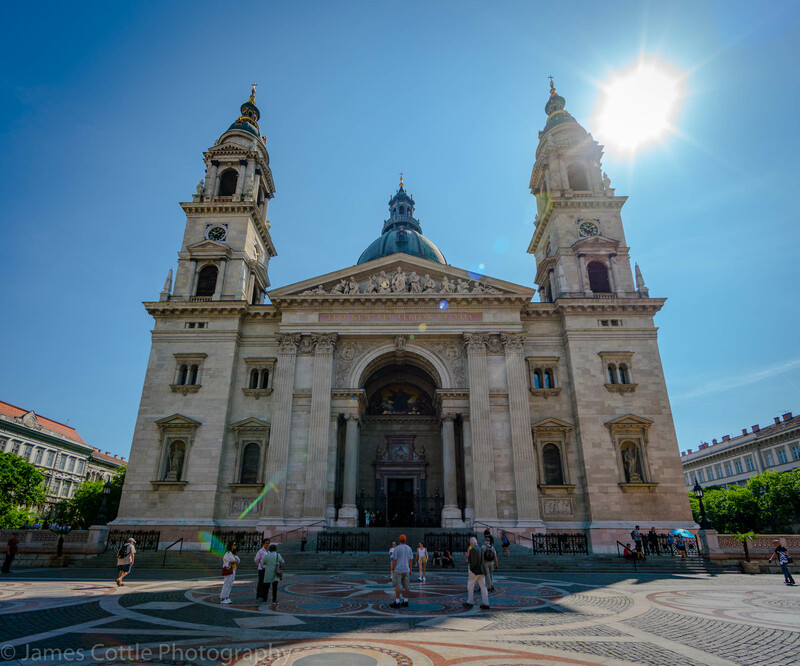 The first city on the tour was Budapest, Hungary. Featured here are my brother’s photos of the major architectural sites that one can visit in only two days in Budapest. I have also included a few photos of my own where I thought them appropriate. Jim is an excellent photographer. In the photos that follow I encourage readers to view them on a computer monitor instead of a telephone, if they get the chance. All of the architectural photos can be enlarged by simply clicking on the photo itself. An appreciation of the architectural detail is best revealed on a computer monitor instead of on the screen of a telephone or tablet. In any case, I hope you enjoy the photos below. 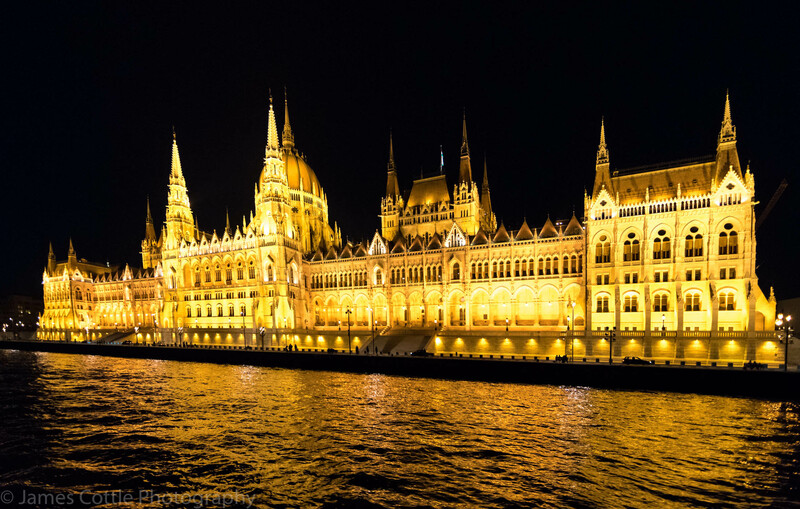 The Hungarian Parliament Building, shown below, is truly a remarkable structure. It is undoubtedly one of the most beautiful buildings in the world. Featuring both Gothic and Renaissance revival styles, construction began on the building in 1885. 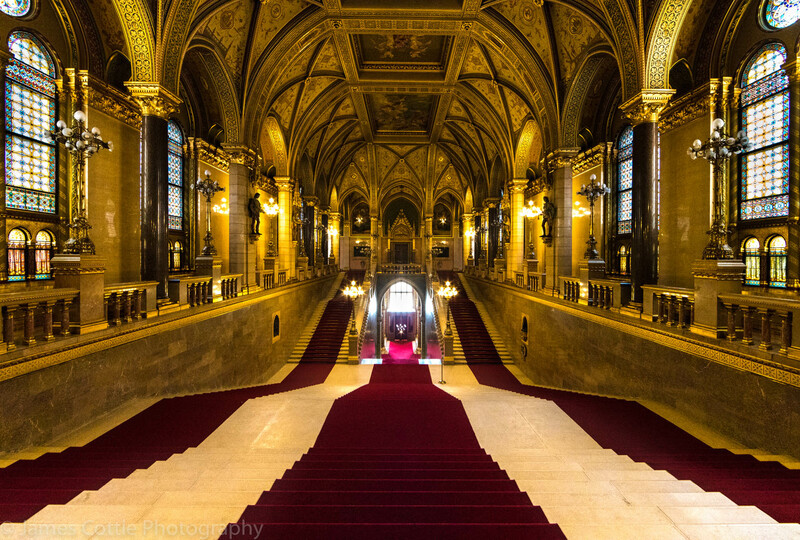 It was inaugurated in 1896, the 1,000th anniversary of the existence of Hungary. It was completed in 1902. The Parliament is open to the public for tours. As might be expected, the interior is magnificent. Gold leaf is used to decorate many of the public halls and chambers. 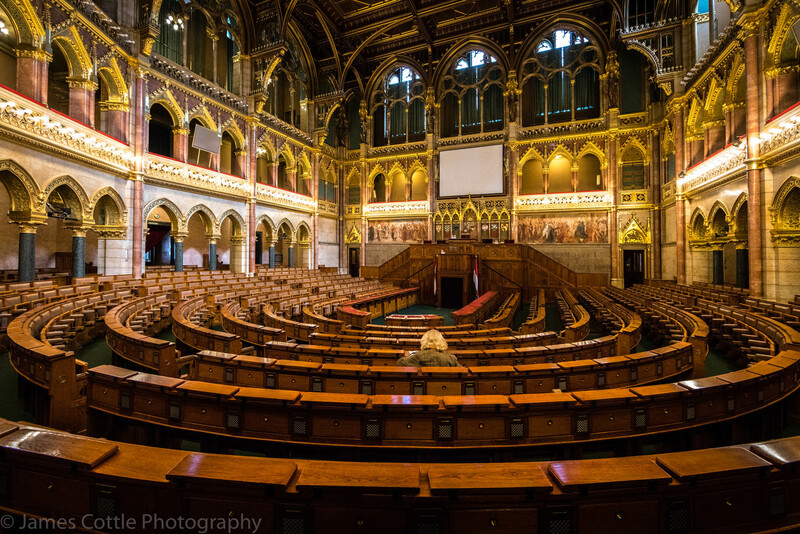 Tours include a visit to the National Assembly Hall, the chamber in which the crown jewels are housed, and if you are lucky, the ceremonial changing of the guard. The interior of the Parliament Building is lavish. Filled with ornate decorations and artistically designed ceilings, it is truly splendid. The next photo is a view of the room that holds the royal jewels. We were not supposed to take pictures of the crown jewels and had that column that blocks the view of said jewels not been there, I might be in a Hungarian jail right now. 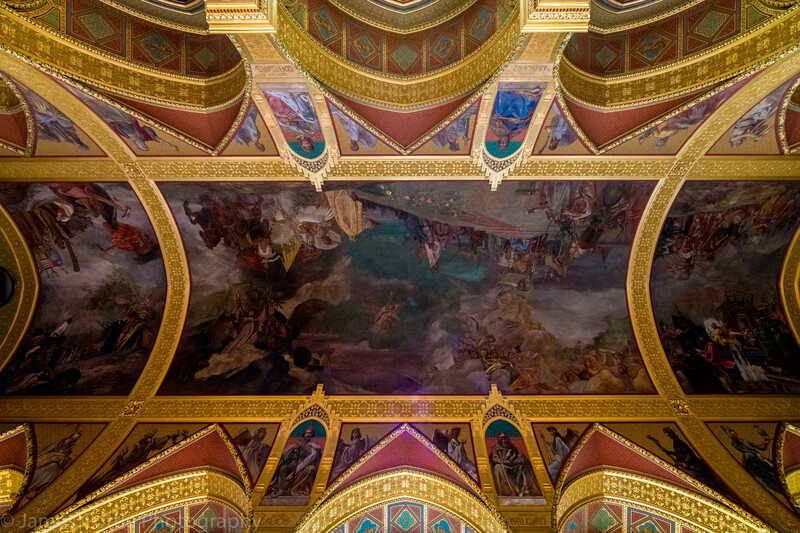 One of the many painted ceilings in the Parliament Building is shown below. The photo below is the Assembly Chamber. Fortunately, there was one person sitting in this great hall, thereby giving a viewer of the photo a sense of perspective as to its size. 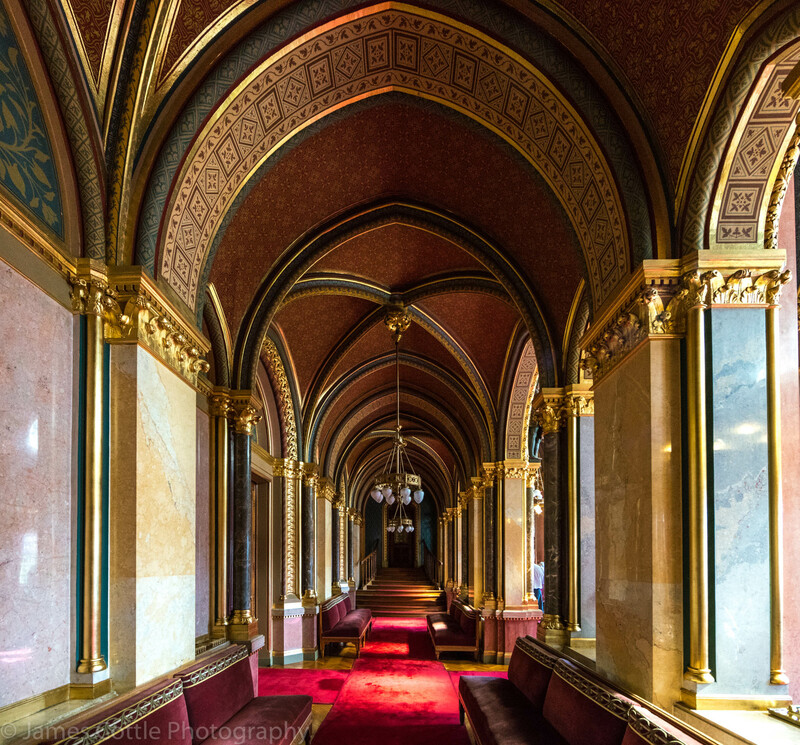 The arches in the photo below give the viewer a sense of the artistry involved in the creation of this majestic hallway. A river cruise on the Danube at night is a must in Budapest. The buildings on both shores are illuminated in a splendid light that enhances the details of the architecture. In the photo below we see the Parliament Building. Below both sides of the Danube are shown with the most majestic buildings seen in the distance. The Buda side of the Danube is on the right and the Pest side on the left. 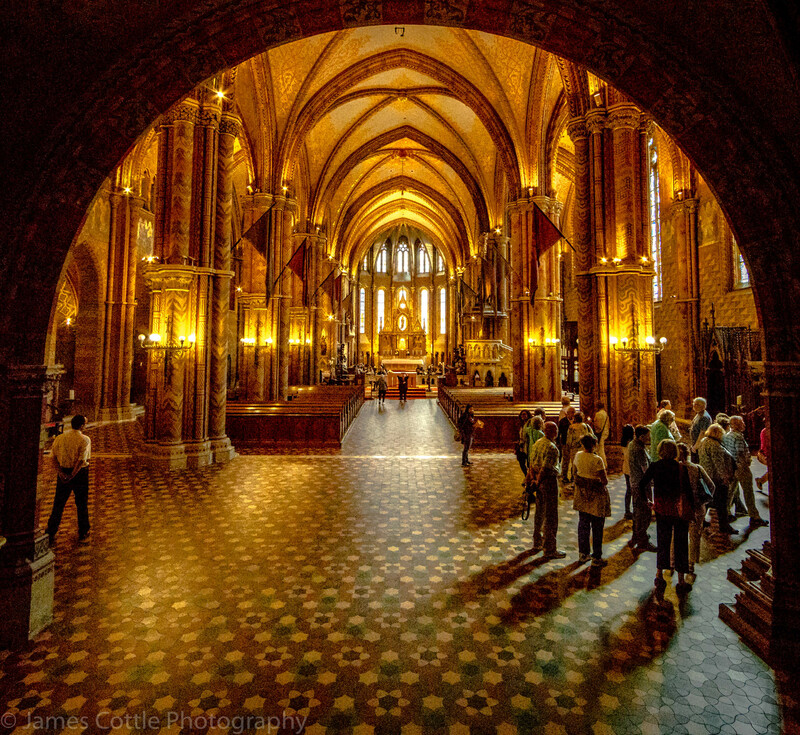 The photo below is of the Matthias Church, so called because King Matthias was married in this location in 1474. The church as it stands today is a neo-gothic design from 1896, but parts of the church were built as early as the thirteenth century. 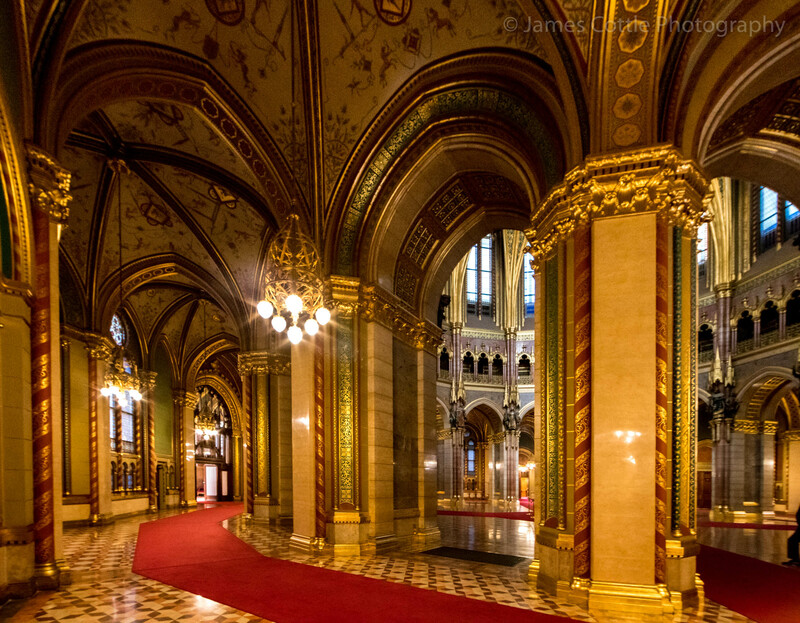 The interior of the Matthias Church, shown below, is truly splendid. It incorporates Gothic elements from the thirteenth century, containing much gold leaf and numerous frescoes. 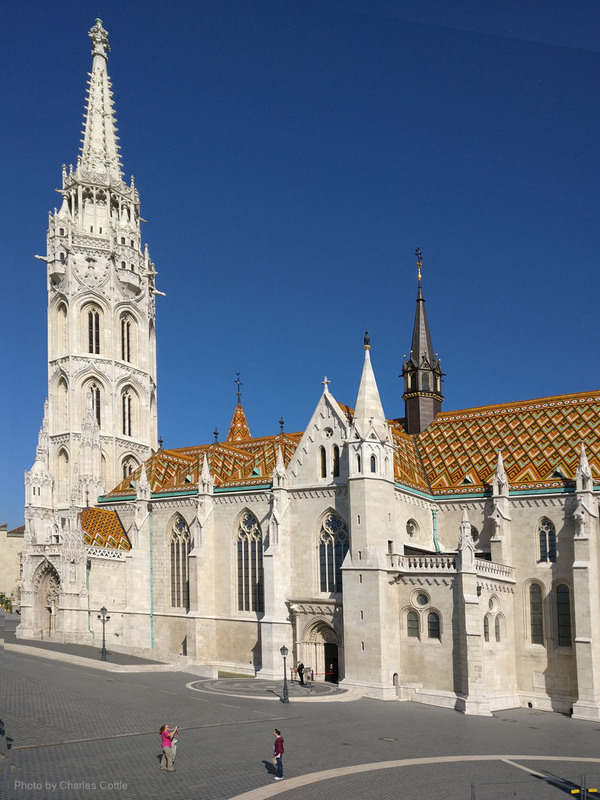 Just before leaving the Matthias Church, the church organist began to play Bach’s Toccata and Fugue in D Minor. The music from the magnificent organ was overwhelming. I felt as if the entire church might levitate right then and there. So impressive was the music and the environment that I’m sure even non-believers were awe-struck. 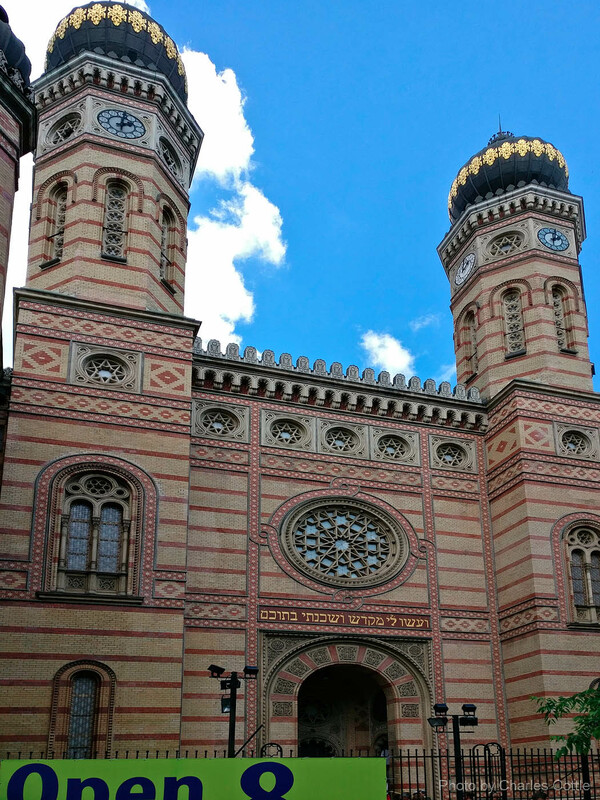 The Great Synagogue, shown below, is the largest synagogue in Europe and it is the second largest synagogue in the world. It was built between 1854 and 1859. During World War II it suffered extensive damage and was used as a stable by the Nazis. In the communist era it once again became a prayer house for the Jewish community. The building, as it appears today, is the product of a restoration begun in 1991 and finished in 1998. The restoration was complete with a five million dollar grant from Estée Lauder, a Jewish-Hungarian American. During WWII the synagogue was in the Jewish Ghetto. In a courtyard beside the synagogue is a cemetery in which some 2,000 victims of Nazi occupation are buried. 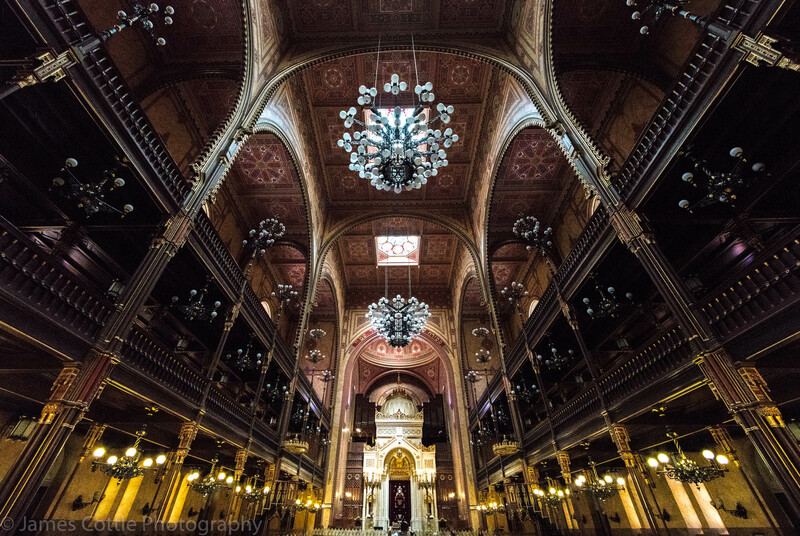 The interior of the synagogue, shown below, seats almost 3,000 people. 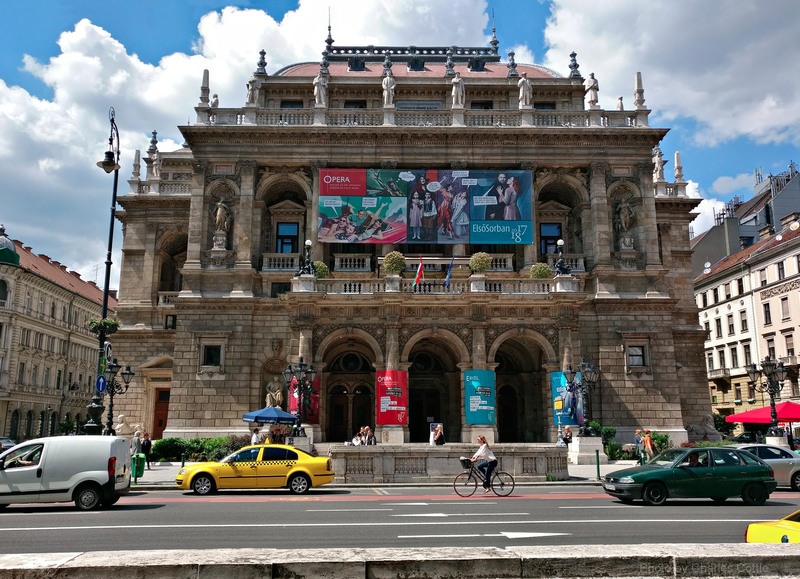 To the untrained eye such as mine, the Hungarian State Opera House in Budapest (shown below) appears unimpressive and poorly situated on a busy street. Closer examination, however, reveals a beautiful Neo-Renaissance building with a symmetrical facade that features sculptures of Franz Liszt and Ferenc Erkel, Hungary’s best known composers. The opera house was opened in 1884, and seats some 1200 people. According to several sources, the acoustics of the opera hall are superb. Unfortunately, due to the short visit, I was unable to experience that most important feature of the hall. 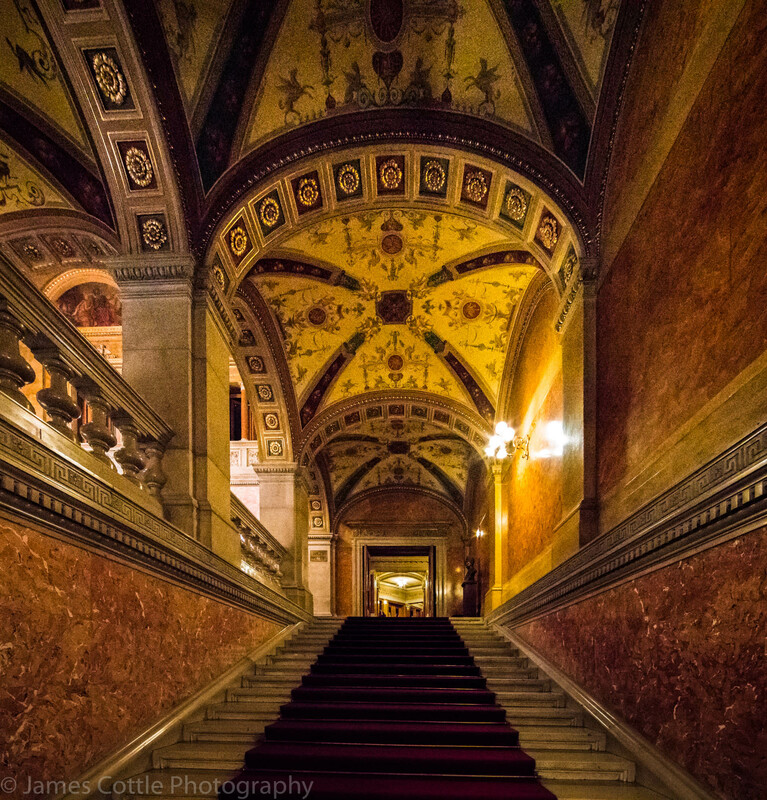 Below are several photos from the interior of the State Opera House. 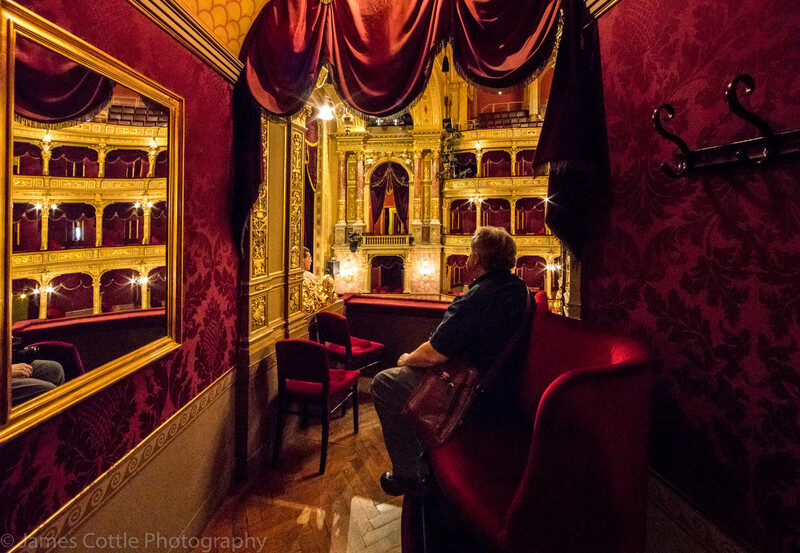 Below is a photo of me sitting in his private box overlooking the stage and opera hall. Unfortunately, there was no performance at the time. 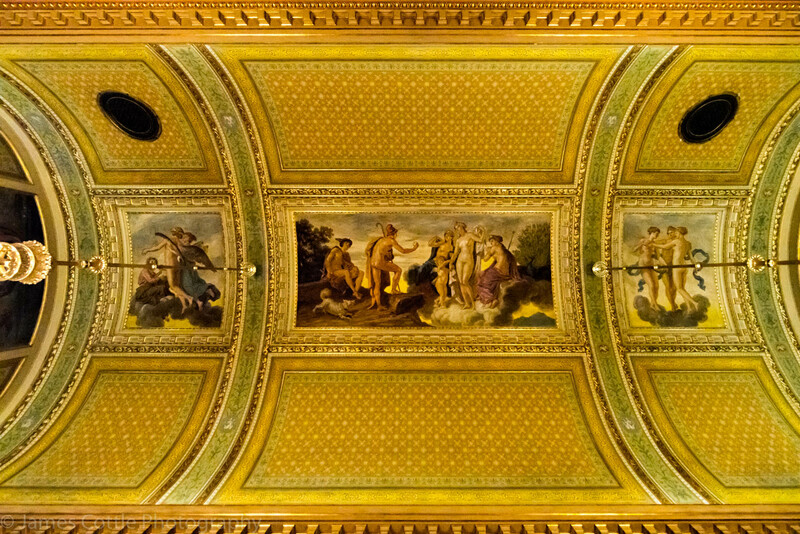 Below is a ceiling detail in the State Opera House. In the center there is a version of the Judgement of Paris. Paris can be seen offering the golden apple to either Hera, Athena, or Aphrodite. As we know, he gave the apple to Aphrodite in exchange for Helen, the most beautiful woman in the world. And thus commenced the Trojan War. Here is a photo of the bar inside the opera house. Historically, this was the magnificent location for intermissions in the performances. The church below, St. Stephen’s Basilica, is a Roman Catholic basilica named after Stephen I, the first king of Hungary (975-1038). Reported to accommodate 8,500 people at once, it is a major tourist attraction. The church was completed in 1905. Because of the collapse of the dome in 1868, the construction of the church took 54 years. Interestingly, the dome is 96 meters high, the same height as the Parliament Building. The symbolism attached to this fact would appear to equate the significance of the spiritual and temporal realms of authority. Both the exterior and interior of this church are stunning. 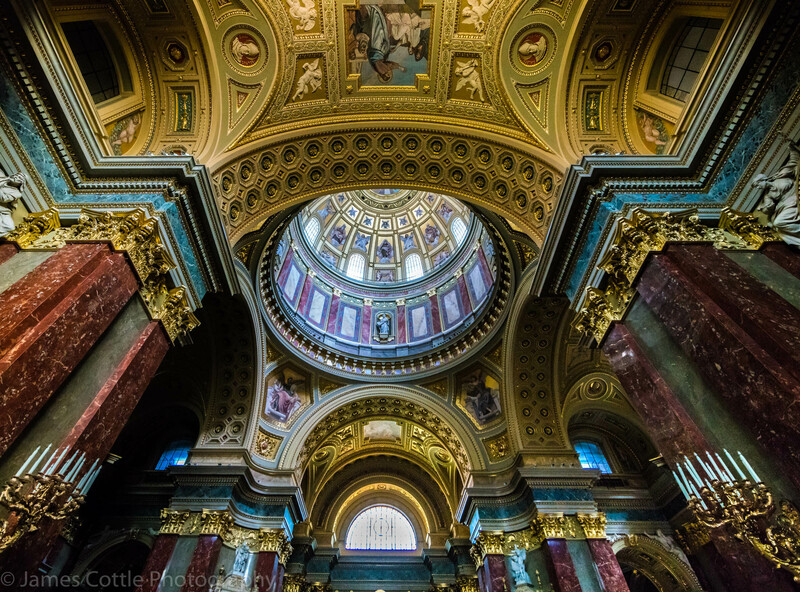 A view of the interior of St. Stephen’s Basilica is shown below. 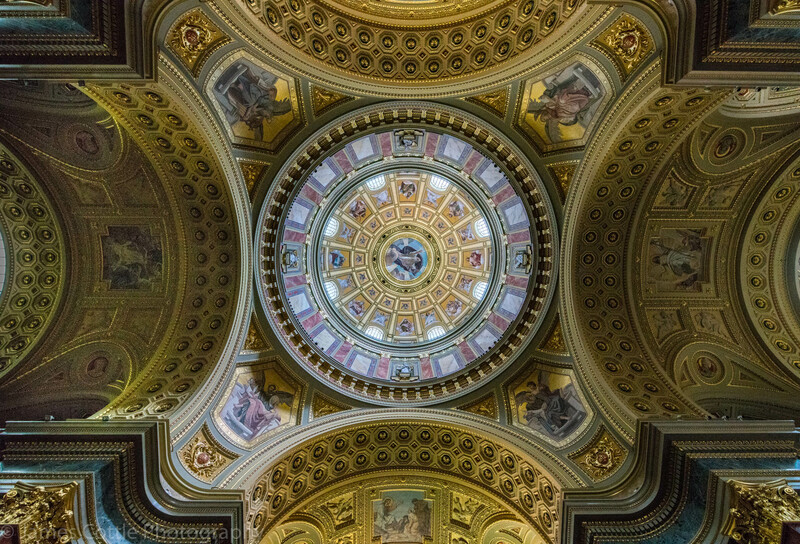 And here is a photo taken directly below the dome of St. Stephen’s Basilica. The reliquary in St. Stephens’s Basilica draws many tourists as it contains the right hand of St. Stephen himself. In the snapshot below tourists line up to view and take photos of St. Stephen’s dismembered hand. For my part, I abstained on both counts. 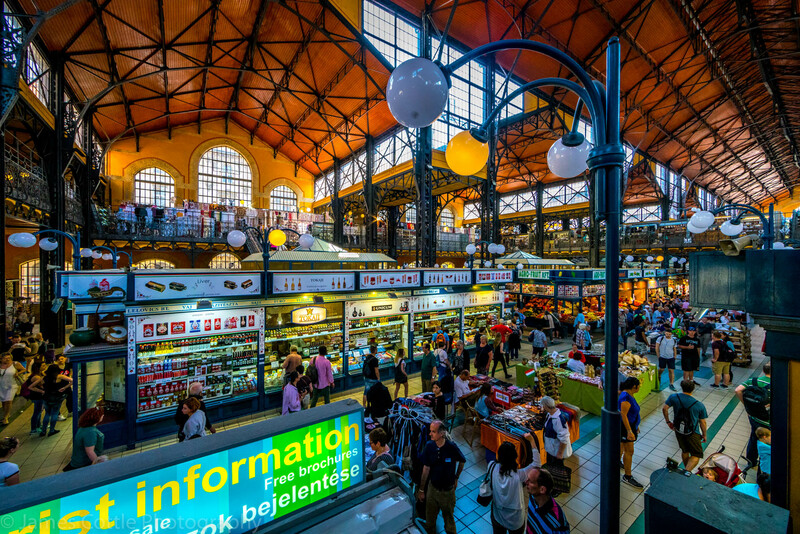 Dating from 1896, the Great Market Hall in Budapest contains a huge number of stalls on three floors that sell produce, meats, housewares, souvenirs, and other sundry items. There are also a number of good places to eat lunch. I had an excellent plate of goulash in one of the establishments on the second floor. 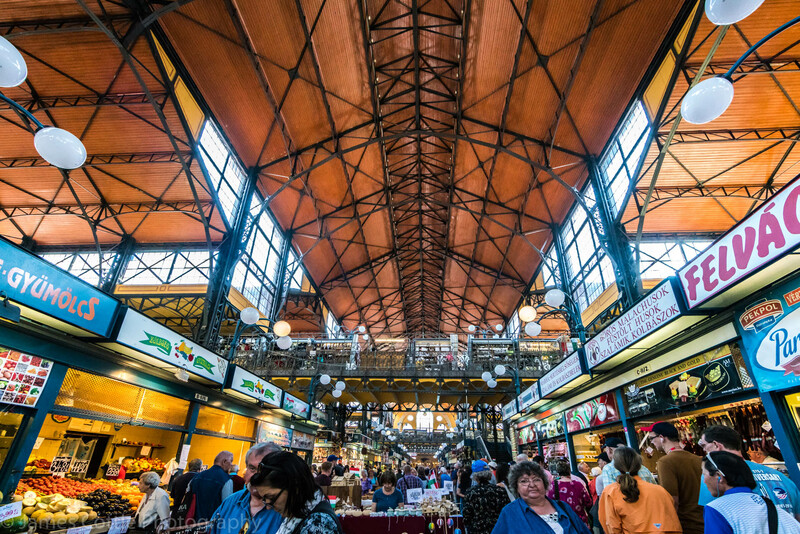 My brother, Jim, said the Great Market Hall made him think it was a cross between the Los Angeles’s Grand Central Market and the Bradbury Building—only 4 times larger. 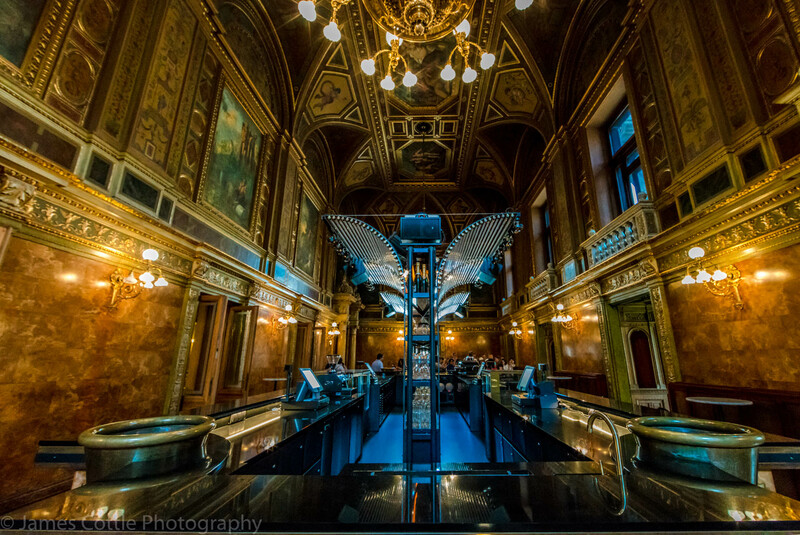 Those who like to travel know that two days is an absurdly short amount of time to get to know a city like Budapest. On tours such as the one my brother and I took, one can only see the major tourist attractions and little else. Such visits are superficial, especially since one has little or no opportunity to speak with local inhabitants. Nonetheless, it is better to visit than not visit, if only for a short time. If nothing else, a short tour whets the appetite for a longer and more extensive return trip. Budapest is a beautiful city. I look forward to seeing it again. James Cottle is retired after working 28 years for NBC in Burbank, California. His major interests include travel, science, and photography. He now happily resides in San Miguel de Allende, Guanajuato, Mexico. Boy, there’s something about old world elegance, and you captured it. Wow! We have been to Budapest, but missed so much, especially inside the Parliament and other buildings, that you and you brother saw. Exquisite photography and wonderful narrative accompanying the pictures. Bravo to you and Jim.